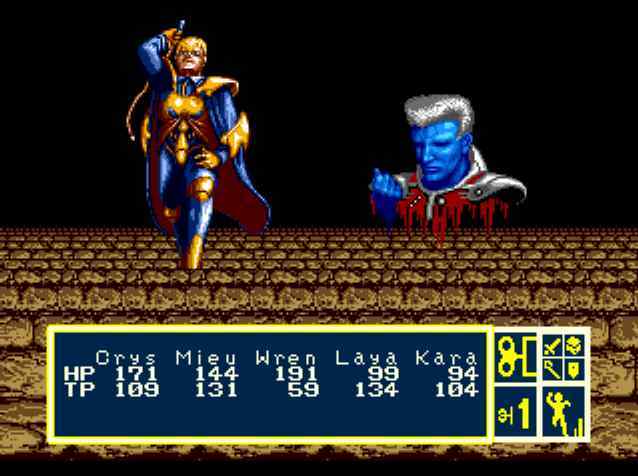 0000000Phantasy Star 3 is perhaps one of the greatest games of all time. Sure, it's not Final Fantasy, but it has it's own distinct flavor and style. The theme is post apocolyptic future in space where civilization is in these space ships that look like a collection of 7 domes organized in a hexogonal formation. You get between these via temples and caves (only by caves in the beginning). As the game progresses, you get to use a ship and a spaceship (The cyborg Wren transforms into these). 0000000I would estimate the game to be about 70 hours of gameplay, mostly due to the fact that the framerate is so slow (in one of the emulators I increased it, but that emulator screwed up the music when I changed to XP recently so I had to stop using it). If you are an RPG fan, and an experienced one, Phantasy Star 3 is definately one you should play if for no other reason besides it's a classic, just as someone who reads for a hobby should read all the famous authors. 0000000Graphics/Sound: The graphics were done pretty well considering it was one of the first games realised for the genesis. Some of the tunes in the game are simply really good, and there's no denying this, and some are just awful and will drive you off the wall. 0000000Gameplay/Innovation: I have to give this game some points for innovation because of the fact that it's a classic, just like I gave Dragon Warrior. I believe this is also the first game to have a non-linear storyline. Now the only other RPG that I can think of with a non-linear storyline was Saga Frontier, which did a totally horrible job. There are 4 completely different pathes you can take in a binary-tree type structure (as you will see if you ever need to go to the online walkthrough, which is available if you do a google search (phantasy star 3 walkthrough), and I suggest you go to this only when you're really stuck. You'll feel better about yourself if you can get all the way through the game without using it, but I know I did (twice). Be warned though, there are many parts of the game where they simply don't tell you what to do or where to go, and I would say trying to figure this out was far the most difficult aspect of the game (the end boss battle was rather simple, and I was thankful for this). So overall I think when I do the weighted averages it will compare well with the other games on this site. 77% The themes are either really good or really bad. 80% Storyline was alright. Fun game overall. Ending sucked. 30% You won't play it again.